A decent 1/1 due to his ability to move a potentially important card out of your opponent's hand. The question is whether you prefer his ability or having a turn one 1/1. I think the 1B cost keeps him out of most constructed uses. In limited where your opponent is likely to have fewer really good cards I think he makes most cuts. Overall the Fiend is a decent creature but nothing really spectacular. 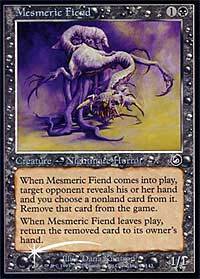 Chapman Mesmeric Fiend is an interesting card. 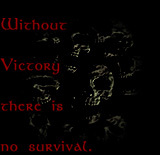 While it has certain benefits over Ravenous Rats, it has weaknesses, as well. The Rats have seen play in numerous decks throughout their existence, and I think Mesmeric Fiend will see play, too. Expect to see it most in black weenie decks. In limited, it's very useful, as it can counteract the best card they have in their hand at the time you cast it. If they try to kill the Fiend, they waste a much valuable removal method to do so. A solid pick if you are playing black. Watson This card just seems generally weak to me. If I want to make my opponent discard something, I want them to get rid of it permanently. Also, I think there are other cards that are better to play in the two casting cost slot right now. I don't think much higher of this card in limited. I excluded him from my deck in sealed deck this past weekend. In draft, I only see myself taking him late in a pack or if I get stuck with him. Even then, I probably wouldn't play it.. In general, he's weak and his effect isn't all that great. I would rather take my chances with an Unhinge. Peatross Why isn't flying on this card? I guess he's semi superior to Ravenous Rats cause you get to pick the card, but essentially every other creature in the set kills this guy. Maybe if you think of him as a potential coercion for 2 that could possibly attack, could possibly just never attack, then it might be good. I don't think its very solid. Constructed is 1, Limited is a 2. Why didn't they just call it Mesmeric Rat? I'm sure this guy is PLAYABLE, but I'm not sure he's good, or as abuseable as Ravenous Rats. In fact, I'm sure he's not as good, since the card loss isn't permanent. It does prevent abuse of flashback or threshold for a while, but when your creature dies, so does the card economy. The thing I like about Mesmeric Fiend over Ravenous Rats is the improved disruption. Generally, Rats will get the worst card in the opponents hand while the Fiend will get the BEST card in the opponents hand. Yeah it may be only temporarily but if the opponent has to use another card to remove the Fiend... it still served a purpose. Duress, Addle, and now Mesmeric Fiend make for a whole lot of NASTY hand disruption Black has access to in Constructed. Hornberg Mesmeric Fiend is actually not bad. I've seen better, and he isn't that great a variant for Duress, but to tell you the truth, he's still very playable in constructed. He works well as a supplement to Duress, making it 8 discard spells in a mono black deck, or in just about any deck runing heavy black. His problem is that he's only good in decks with heavy black, he's second best everwhere else. So, in Constructed, I give him a 3.5. Useful, but only in the right deck. In limited, he's kind of blah. Discard is like life-gain in draft - it's not really needed. Thus, he's going to be a late pick, and an overcosted 1/1. Still, his effect is useful, but not greatu. In limited, he gets a 2. Not a last pick, but definitely not within the first 5 or so picks. I really like the fiend in Limited since it lets you see your foe's hand and also get rid of a card out of it. In Constructed, I would rather have Duress on turn one instead of this guy on turn two. He's not too terrible, though.